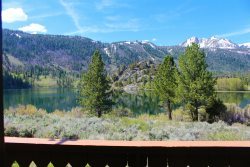 Everything you need in a base-camp condo for the High Sierra vacation of a lifetime. Unit 28`s building in the Winter Views from Unit Living Room Bright living area Plenty of comfortable seating Master bedroom with a queen bed Master bedroom with TV and electric fireplace Master Bedroom Master bathroom with tub/shower combo Guest bedroom with queen bed Dining area with views of meadows, mountains and Gull Lake Kicthen stocked with everything you need. Upgraded kitchen with small flat screen. Relax, cook and catch up om yoru favoirte shows. Yes This really is the view. Come and see why the High Sierras have been a favorite alpine retreat for generations. Here in June Lake, the soul is rejuvenated and nature reminds you of the simple things. Clean air, glacial lakes, alpine hospitality... you'll love the condominiums at Interlaken on the shores of Gull Lake. During the Spring, Summer and Fall, pursue the plentiful and tasty rainbow trout found in June Lake, Gull Lake, Silver Lake and Grant Lake. During the Winter months, take advantage of the uncrowded June Mountain Ski Resort or take a short drive to Mammoth Mountain Resort. The powder skiing is exceptional for beginners and back country skiers alike. There are also many other snow play activities including snowmobiling, sledding, and cross country skiing. Entering this classic condo and you will feel right at home. The hallway, with plenty of storage, leads to two rooms with a full bathroom in between. Both rooms have pleasant and lovely views with a wall fireplace and TV. There is a queen in the master and also in the second bedroom. The new couch also has a queen pullout. A few steps further down the hall is the open and light great room. Take in nature in this room with astonishing views of Gull Lake and June Mountain. In the great room there is a fireplace,Smart TV, DVD player, Blu-ray player, and wireless internet. The kitchen which is fully equipped and up to date, also has a washer and dryer. Dining room table seats six with three at counter. Outside activities are plentiful with private deck, gas BBQ, three hot tubs in complex, and tennis and basketball courts. There is also a walking trail that takes you down to Gull Lake for swimming, hiking, the marina, and also Gull Lake Park. - Walking trail with quick access to lake, swimming, fishing, and community park. Super helpful and answered every question we had. Thanks for a great stay! We plan to return next year and hope we can get the same spot. They were pleasant and friendly when keys were returned at the end of the stay. All phone conversations were helpful and staff was always pleasant. Our vacation was wonderful and the condo exceeded our expectations. The condo was beautiful and the view was amazing. It took your breath away. Awesome property, have been in multiple units . Have been coming here for several years. Staff emailed us the morning of our arrival of road conditions. Had a great time with our family! !